I have always been amazed at the different varieties of backslash tile. There are so many options to choose from it's almost overwhelming! Also, tile is not something that can be easily changed or removed, so it is important to choose something that is timeless or something you really like and won't get tired of. I ran across some very lovely and unique tile ideas by Ann Sacks that would surely make a grand design statement! I'm not positive that I would classify some of them as "timeless" designs, but they sure are fun to look at! 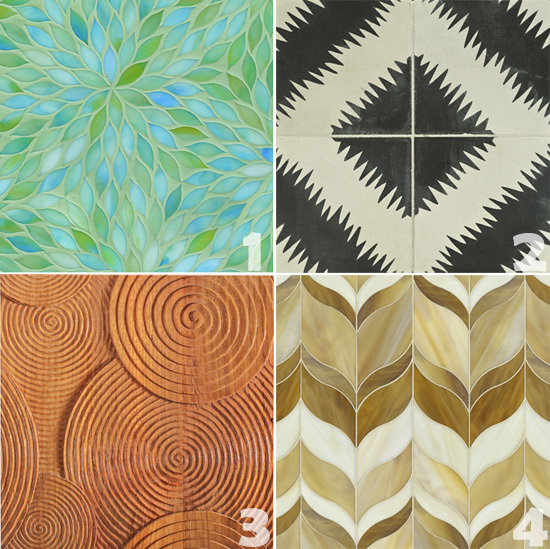 Would you use any of these tile designs in your own home? These are great. Although I typically gravitate towards classic backslashes, I also have a soft spot of some of these unique tiles. lol, backsplashes! Sometimes I hate auto-correct! I don't think I'd branch out to these type of blacksplashes, but I do like the statement they make! oh love those designs and patterns!! I refuse to feel guilt about t.v my kiddos aren't in school and are awake about 14 hours out of the day...lol...plus everything is educational and a little t.v. in moderation never hurt anyone! I like 1 and 3. I dont know about a kitchen though. I like crazy rugs (random) and I think these back splashes would translate great onto a rug..ha does that even make sense? 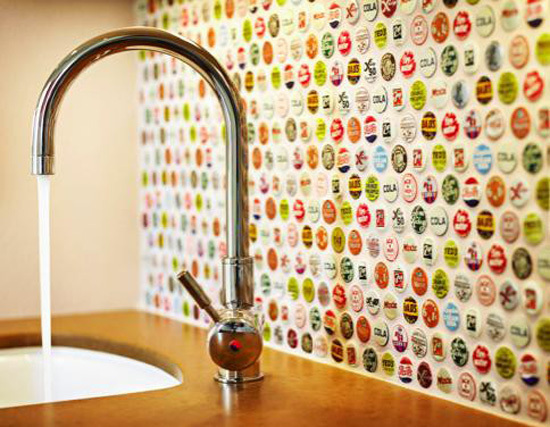 Love the bottle top splash back! My kids collect bottle tops... I wonder if it would work when we finally get around to renovating our kitchen. What would you stick them in and seal it with?